A project encouraging young people to embrace different cultures in a bid to tackle hate crime has celebrated its end for 2018. Year 6 pupils learnt about Chinese calligraphy, Bollywood dancing and African singing and drumming as part of the Tending Junior Warden Project, in its fifth year. They also met with 16-year-old Syrian refugee Zak, who now lives in Colchester, who told of his experiences of hate crime. A celebration event, held at the Tendring Education Centre, Clacton, gave the children – from St George’s C of E Primary School, Great Bromley; Great Bentley Primary; Holland Park Primary, Clacton; Alton Park Junior, Clacton; and Harwich Community Primary schools – the chance to show their family what they had been learning. 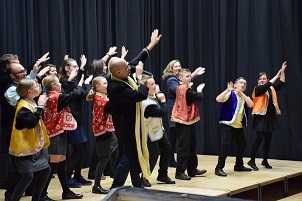 Pupils gave a demonstration of Bollywood dancing with Indi Sandhu and performed an African song with Efua Sey. Also, nominated pupils from each school shared testimonies that detailed their learning as a result of their involvement in the Junior Warden Project. The initiative was funded by £10,000 from the Essex Police, Fire and Crime Commissioner’s Community Safety Development Fund and organised by Tendring District Council (TDC). Five schools took part this term, while six others took part in the summer term. Lynda McWilliams, TDC Cabinet Member for Health and Education, said the project had been a huge success and planning was already underway for next year’s Junior Warden Scheme. “The celebration event was wonderful, to see what the youngsters have learnt not only about different cultures but also about embracing and accepting those cultures,” Councillor McWilliams said. “Although this is a Tendring District Council project, it could not be achieved without our partners. Working together is very important, and a further demonstration to the children of what can be done as part of a team. Roger Hirst, the Police, Fire and Crime Commissioner for Essex, said: “I’m delighted that we can fund excellent projects like this through our Community Safety Development Fund to help educate young people around issues like hate crime.